Coimbra, in central Portugal, is Portugal's historic University city. It lies some 75 miles south of the second city of Portugal, Oporto. 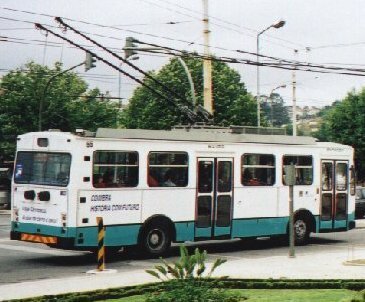 For the transport enthusiast, Coimbra has a tram museum and a fully operational trolley bus system. The lower town has a lively shopping centre whilst the upper town, which can be reached by trolley bus, houses the University. The University has several buildings open to the public, most notably the baroque university library. 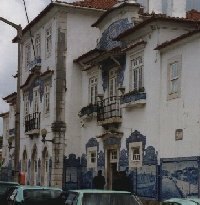 Train services from Oporto to Coimbra pass through the picturesque town of Aveiro, which is also well worth a visit. 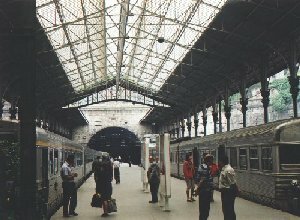 L to R: Inside the concourse of São Bento; the platforms leading to the tunnel. 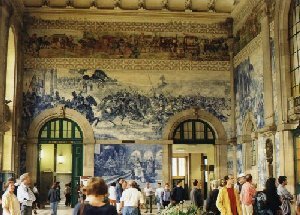 The journey starts at São Bento station and before boarding, the traveller should allow some time to view the striking ceramic tiled murals in the station concourse. The station itself is compact because the eight platforms run immediately into a double-track tunnel. The tunnel emerges into daylight at a high level above the River Douro, which lies to the right. From the train there are striking views of the now defunct Dona Maria Pia railway bridge, beyond it the D. Luís double-deck road bridge and, close at hand, the slender S. João rail bridge. Also visible is the new road bridge under construction (2001). The train soon runs into the extensive station at Campanhã. This is the Oporto's main station, though inconveniently situated well out of the city centre. 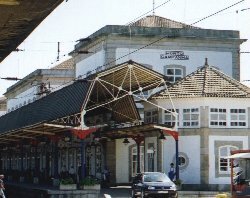 To the left of the train as it arrives from São Bento is the main station building. There is a very handily sited café/bar on the same platform, which is a good spot from which to watch the trains go by. Outside the station are bus stops for STCP bus services into the city centre. To the right of the train are sidings and at the far end of the station, to the left are more sidings and carriage sheds. The train for Coimbra now reverses out of Campanhã and heads back towards the Douro, which it crosses at high level on the 1,029 metres-long S. João bridge. From the right of the train there are fine views of Oporto and, on the left bank of the river, the town of Vila Nova de Gaia, with its port wine lodges. Almost as soon as the train reaches the south bank of the Douro, it draws into the fairly recently enlarged station of General Torres, which has four platforms. There are fine views of Oporto to the right as the train departs from the station. GRANJA (18km) This town has a goods shed and the platform buildings of the station itself are beautifully decorated in ceramic tileware. These tableaux depict local boats as well as tourist sites such as Batalha and Coimbra. On the left is a neat station garden, whilst the Atlantic Ocean is now visible to the right. Newly constructed apartment blocks are visible to the left, with beaches to the right as the train reaches Espinho. Goods sidings on the right herald Ovar, where an old Divisão de Pontes (Bridges Division) carriage is parked (2001). On the right, the station building has some lovely tiled scenes depicting both CP locomotives and local landscapes. Carriage sidings are sited to the left. The train leaves the station with fields on both sides. This is another pleasant station with tiled rural figures and scenes on the station building. As the station is departed, a Nestlé factory can be seen in the distance (left) but fields occupy the nearer space. SAMOUQUEIRO (49km) This is a halt. After a small wood has been passed, the railway siding and factory complex of Adubos de Portugal SA (chemical fertilizers) is seen, followed shortly by a large school and the outskirts of the town of Estarreja. There is a large water tower, dated 1944, to the left and a goods siding to the right at this station. Patterned tiles adorn the station building and also visible is a sizeable goods dock, on the left, as the station is exited. CACIA (60km) This small station is exited across a level-crossing and the track then passes through maize fields. On the left is the Vulcano factory and other industrial works. 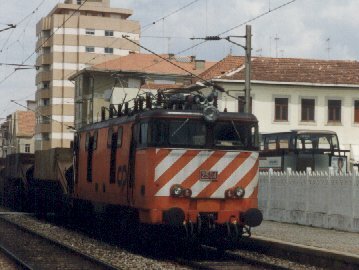 After passing over a motorway the train slows as it reaches the apartment blocks of Aveiro. A large corporate depot is passed on the left as the train approaches the station. AVEIRO (67km) This lovely town, with a canal system, is well worth a visit. Its five-platformed station is well adorned with tiled views of local scenes both on the platforms and on the exterior (seen right). There is a goods bay to the right of the Coimbra-bound platform. A railcar is often to be seen on the left-hand platforms, waiting to depart on the threatened Sernada do Vouga line. This is a somewhat run-down station which is being modernised with European money (summer 2001). Old station signs still bear the former spelling of Quintans. After Quintãs, the train psses through a small wood. After passing under the A1 road, the train enters Oiã, which is a modernised twin-track station, but sadly already disfigured by graffiti. This is another modernised station, with a fussily trussed roof. As the station is left behind, there is a derelict CUF factory on the left; CUF was the state-owned conglomerate which was set up under the Salazar regime. This is a largely open station with an overbridge spanning its two tracks, with an old station building on the right platform. The train leaves through a red-soil cutting and hills become visible inland in the distance (left). Further tracks join from the right before the water tower of Miraflores station is seen on the left. Another modernised station, but with the old buildings surviving on the right platform. As the train leaves here, low hills are visible, left. Again the station buildings are on the right platform, where there is a park beyond. The station has a modern overbridge and vines are cultivated to the left. This halt is a only a short distance from Curia and seems to have little habitation nearby. Nevertheless, it boasts a modern overbridge and, once again, vines to the left. After leaving here, the train passes a large disco and swimming pool sited somewhat incongruously in these rural surroundings, on the left. Apartment buildings on the left herald this stop. The station is modern and uninspiring. A football stadium, with floodlights, is nearby on the right, before industrial plants can be seen on both sides of the track. SOUSELAS (114km) Both the main station building and sidings lie to the left, as does the town itself. In the middle distance is a ridge. As the train enters it passes the extensive Ceres Sanitários ceramic works on the left. The station itself is a small halt. As the train leaves here, the main IC2 motorway runs alongside on the right and then crosses the line by a flyover. This station is a single island platform with large silos adjacent to the station, left. COIMBRA- B (122km) Coimbra B(ifurcação) or Coimbra Junction lies on a curve which takes the main line west to Figueira da Foz and south to Lisbon. It is therefore often necessary to change here to get to the city centre, some 1.7km away. The River Mondego lies to the right as the train pulls into the terminus station. On emerging from the station, there is a five minute walk, straight ahead to the centre of the modern (lower) town at Portagem, where there are some handily-placed cafés. From Portagem trolley buses (seen right) and buses run to to the upper town and University. A few hundred metres further on, to the right, is the former Coimbra Parque station platform, alongside the main road. However, the station has recently been moved another few hundred metres further south. This is now a small, modern station lying in a road junction. It is the terminal station for the 38km Serpins branch, which is operated by refurbished Allan railcars. On the left, just off the main road between Coimbra's main and Parque stations, lies the Coimbra tram museum.